Ways to create a frame. Steps to add menu components to a frame. AWT Menus are mostly seen in Windows that have a list of menu items. The user can select a menu item from the list by pulling the MenuBar. When clicked on the list, an ActionEvent is generated, which is further taken up by the ActionListener. As shown in the above figure, MenuItem and MenuBar are not components because their super class is the MenuComponent, and not the Component class. As MenuItem and MenuBar are not components, they cannot be placed in any container. Infact, they occupy a very less space in the frame. MenuBar : It is placed at the top of the screen and consists of menu items. MenuItem : It represents the selection made on menu items. Menu : It gives the drop-down list of menu items present in the MenuBar. 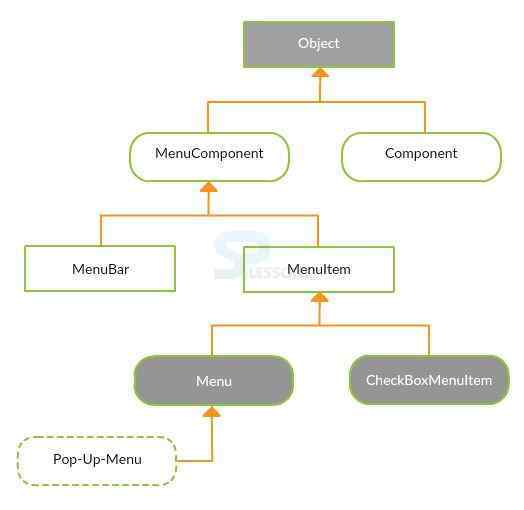 CheckBoxMenuItem : MenuItems can be made visible or invisible using the CheckBoxMenuItem. Applet opening a frame having MenuBar, when clicked on a button. Applet using the created pop-up menu. Applet having menu in a web page with the rectangle shaped drop-down box. 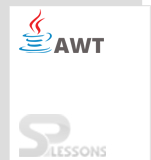 AWT Menu can be loaded faster when incorporated in an applet as it is not required to load the class from the network. Moreover, if Menus are used with Applet, they can have great look and feel. As Applet cannot contain Menus directly in it, it must be placed in a Frame initially. Find the frame of the applet using the below code. Create the menu bar and add it to the frame found. Develop menus and push them to the menu bar. Create Menu items and attach them to menus in the menu bar. Selection Events are never passed to an applet as they cannot be handled by the MenuItem. Hence, custom menu items are used here by declaring explicitly. MenuBar consists of Menu and MenuItems. Menus are not the components. Applet contains a frame consisting of MenuItems.